How Did Snake Valley Get Its Name? How did Snake Valley get its name? Well, it depends who you ask, because there are several different answers. Mrs. E. W. Clay, early resident of Burbank, Utah in southern Snake Valley, wrote that Snake Valley was named for the Snake tribe of Indians who inhabited the valley (in Day and Ekins 1951, Milestones of Millard; 100 Years of History of Millard County, p. 180). Helen Carlson, author of Nevada Place Names (1974) states that the Snake Range is sinuous like a snake, and thus earned its name. However, she notes that early historian Myron Angel called it the Snake Creek Range, possibly indicating that the range was named for the creek. She also acknowledges that the Snake Indians may be the reason for the name (p. 219). I recall reading that before Snake Valley was so named, it was called Greasewood Valley, but I can't remember the source. Are there other stories out there about how Snake Valley got it's name? There probably are, and if you know one, please leave a comment! How do you think Snake Valley got its name? 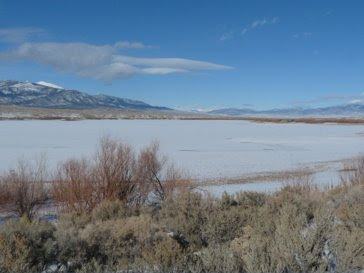 Snake Valley is a great place for birds, with over 180 species noted (Bird List for Snake Valley). 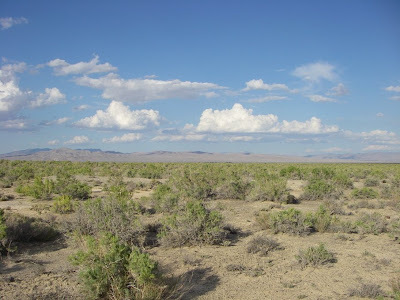 Three Important Bird Areas are found in the valley: Fish Springs National Wildlife Refuge, Great Basin National Park, and Mount Moriah. Each of these areas is recognized as containing important habitat for birds. In order to find out how bird populations are doing, a variety of bird counts are held each year. 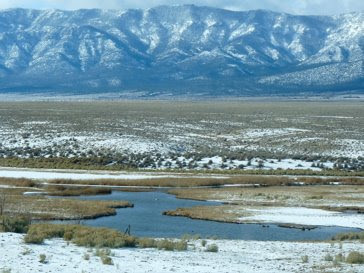 Around Christmas time is the annual Christmas Bird Count, with one held in Baker, Nevada and the surrounding area, and the other held at Fish Springs. This year, the one in Baker was held December 16 and the one at Fish Springs will be January 4. The Christmas Bird Count as a whole has been going 109 years, starting in 1900. Back in those days, there weren't many bird watchers, but there were a lot of bird hunters. In an effort to stop the annihilation of hundreds (or thousands) of birds every year just for sport, Frank Chapman of the American Museum of Natural History proposed an idea. Instead of the "side hunt," where people took sides and saw which side could shoot more birds at Christmas, people would count birds instead. The idea took hold, and the Audubon Society took over the Christmas Bird Count. Today it is held in 22 countries in the Western Hemisphere. The count is conducted within a 15-mile radius circle on one day between December 14 and January 5. Everyone is welcome to join in for the Christmas Bird Count, even if they've never done it before. New participants are paired with more experienced birders, and thus they get a great lesson in bird identification. If you're thinking that there just aren't many birds around in winter, it can be surprising when you only focus on birds for an entire day. They start showing up everywhere. 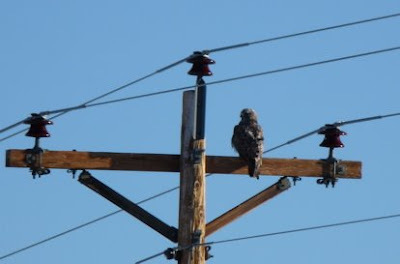 Some of the birds can be obvious, like the raptor perched on the power pole above. The white speckled V on the scapulars (shoulder feathers) helps to identify this as a red-tailed hawk, the most common roadside buteo. Other raptors I saw on December 16 included a second red-tailed hawk, a rough-legged hawk, a golden eagle, and a merlin. Some of the birds are quite small, not much bigger than this sunflower seed head. 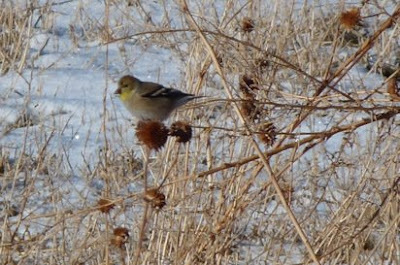 The gold head along with the black and white wing feathers make this bird easy to distinguish as an American goldfinch. A flock darted along ahead of me as I went along the edge of a field. I enjoyed seeing the flash of their golden heads. 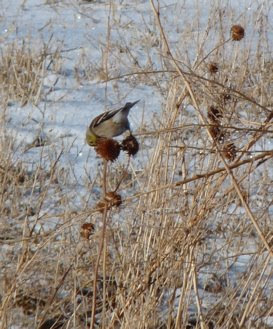 Here's the goldfinch eating the sunflower seed head. Other birds that were common in the fields and feed lots were ravens, blackbirds, white-crowned sparrows, and European starlings. 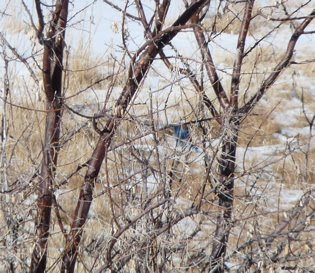 Later, as I stopped next to the road to look at a marshy area, I saw a flash of blue in a tree. The blue made me think of pinyon jays, because we have a lot of those. 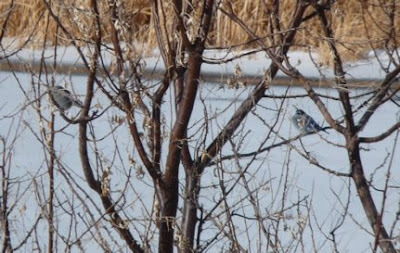 But when I got out the binoculars and looked closer, I saw it wasn't a pinyon jay. Instead, the bird was a bit smaller. The male was brighter blue and the female (on the left) was greyer. This blue bird turned out to be a mountain bluebird. December 16 was a really cold day. In the morning it was only 14 deg F, and the highest it got was 31 deg F. As a result, most bodies of water were frozen over, including this big lake. That meant the lake, which is usually a great birding spot, was not too exciting. Nevertheless, I managed to find a loggerhead shrike and a black-billed magpie near it. Not too far away I found this open water. Why isn't it frozen over? The water emerges from a deep spring, and the water is warm enough that it stays unfrozen for a long distance. Out on the water I could see little blobs, mostly brown, but in the center one white blob. 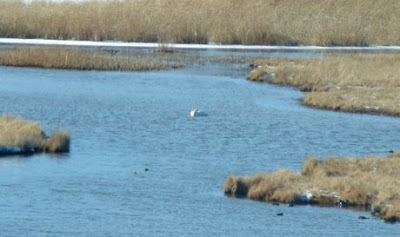 With more magnification, I found my most exciting find of the day: a bird that wasn't on our list--a tundra swan. It might not look very swanlike here because it has its head tucked into its back. Fourteen green-winged teals, about a dozen mallards, and a few northern pintails were also present. At another open-water area I spotted a belted kingfisher and a great blue heron. It amazes me how much variety exists even in the desert. After I had searched the valley bottom, I headed up a couple of the canyons. In one I found a flock of wild turkeys. They ran across in front of me and up the canyon side. Dark-eyed juncos were all fluffed out and chirping quietly as they tried to stay warm in leafless bushes. As I got up higher in the mountains, it started snowing. I didn't see many birds, but finally something flew across the road. I got out and started walking. 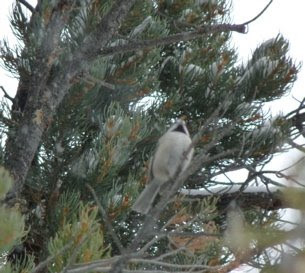 A flock of mountain chickadees was darting around the pinyon pines, with a couple red-breasted nuthatches hanging out with them. A little later I found a Townsend's solitaire. During the winter it often makes a piercing whistle call that is unmistakable. 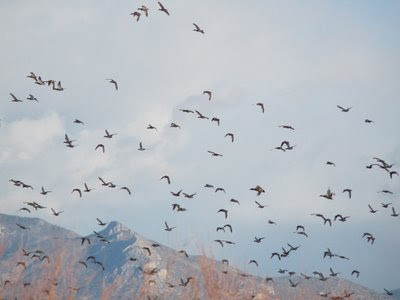 Wintertime is when huge flocks of birds gather near the roadsides. They fly up in front of vehicles and it's difficult to see what they are. 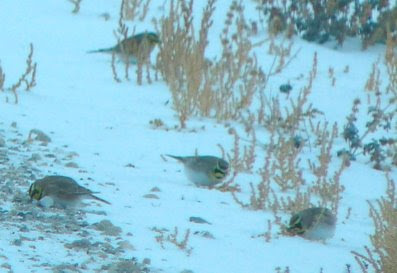 Here I captured them alongside the road, and it's possible to see the yellow chin and dark mask and chest band, although the "horns" that give the horned lark their name aren't really distinguishable. At the end of the Christmas Bird Count day, all the participants gather to tally the birds. On the December 16 count for the Baker area, we found 50 species. If you'd like to learn more, and possibly participate in a Christmas Bird Count near you house (remember, the counts are held until January 5), check out the Christmas Bird Count website. 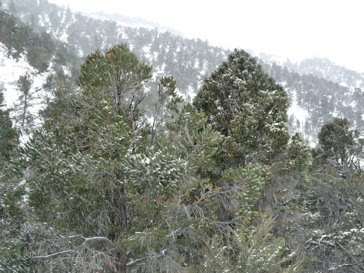 The Fish Springs Christmas Bird Count is January 4, so there's still time to help count the birds in the Snake Valley area. Happy birding!